The resentment is real. It get stronger as the extent of the lying becomes more obvious — particularly the lie that warnings on the consequences of Brexit could be dismissed as scaremongering. 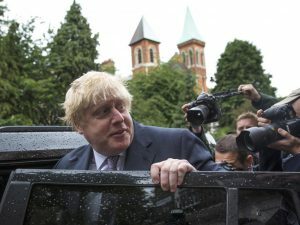 People who are angry with “elites” are discovering that, in Boris Johnson, they have set an Old Etonian with a reputation for lying on the path to No.10. At the very least, this calls the referendum result into question. Stories of people ringing the Electoral Commission to ask if they can change their vote point to changes of heart. Many more won’t have made the call, or know the answer would be “no”. Many of the people who feel they have been duped are invisible and ignored. That exacerbates the divisions in British society that are becoming horribly obvious, and is a case for not heading down the path of Brexit. It is vital to mobilise the anger of these people before Article 50 is invoked and the process of leaving becomes irrevocable. In a different time, many of these would have been core Labour supporters and Labour would have mobilised them. But Labour’s internal battles are getting in the in the way. What can we do to mobilise them? Some of these people will respond to us directly — this weekend there has been LibDem door-knocking in Cambridge which is about listening to people, and conversations about city-wide leafleting. But we also need to be quick to highlight lies from Leave as they become apparent and do all we can to publicise them in the press and online. Nichola Sturgeon is calling for a second referendum on Scottish independence, and there is renewed pressure for a united Ireland: did people voting Leave realise it would mean the end of the UK? Nigel Farage admits that leaving does NOT mean an extra £350 million per week for the NHS. Talks about a “Norway model” which would cost us as much per head as we now pay, and, for the first time, mean being dictated to by Brussels. No drop in the numbers of immigrants. Boris Johnson claiming no-one voted Leave because of immigration. Businesses moving jobs from the UK. Places like Ebbw Vale and Cornwall that voted “Leave” though they receive significant EU funding, and suddenly wonder whether a Conservative government under Boris Johnson would make good the shortfall. People in the fishing industry being told this would mean getting out of EU quotas, and now learning this is not true. That Cameron’s “renegotiation” was a sham because it was not in our interests to repatriate any powers. The last of these points needs special mention, because we couldn’t say it during the campaign but can now shout it from the rooftops. The Tories commissioned the Lords’ Europe committee to do a thorough review of the powers exercised by Brussels so they could draw up the shopping list for renegotiation. The conclusion was that it was against the national interest to repatriate any powers. But Cameron was already committed to a “renegotiation”. Far from being intransigent, the EU threw Cameron a life jacket by coming up with a credible package, that avoided doing harm. Cameron played foul by demanding change that he knew was not needed: that lie, and the extreme generosity of our EU partners, both need exposing. There is a petition which is being used to push for a second referendum. It was actually set up beforehand to change the rules for the referendum, but it’s gaining signatories rapidly and worth signing and encouraging others to sign.